In a move that's kind of hard to understand in the wake of the immense public outreach success of the Hayabusa mission, JAXA is closing JAXA i, its public information center in Tokyo today (December 28 in Japan). There's a story about the closure in English here. I'm not sure what exactly the equivalent closure would be here in the U.S. -- Space Center Houston or the National Air and Space Museum? -- our space history is a bit longer and the collections and galleries quite a bit larger, but still, the closure of "JAXA i" has to be a big blow to the future of space in Japan. 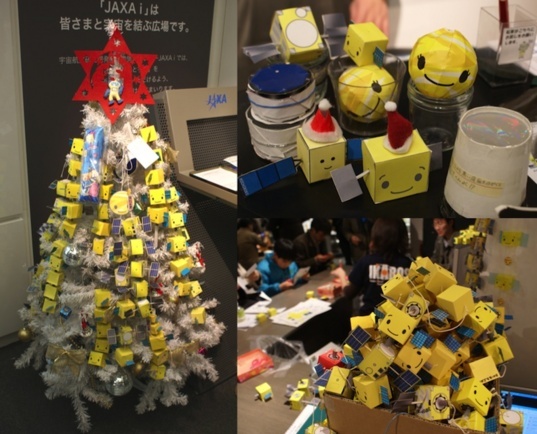 A photo shared by @Akatsuki_JAXA on December 25, 2010 shows just a few of the more than 1000 papercraft models of Akatsuki made by supporters of the project after the spacecraft failed to enter orbit earlier the same month. What's decorating the tree -- and piled in boxes -- are more than a thousand papercraft models of Akatsuki. Watanabe explained that " JAXA i (JAXA's information centre in Tokyo) will close on 28th Dec 2010. In the middle of December, JAXA i suggested that people make an Akatsuki version of 'thousand origami crane' to support Akatsuki and Akatsuki project team, making papercraft of Akatsuki (or Akatsuki-kun) and bring or send them to JAXA i. The photo was what has happened at the moment of yesterday [December 24]. In fact the papercraft are everywhere inside JAXA i more than the photo shows, as I brought one few days ago. The number reached 1000 on 22nd Dec and still increasing." If you want to make an Akatsuki paper model, here and here are links to the patterns. It must be a consolation to the project team to have this public support -- but how frustrating for the public information center to be closing in the wake of Hayabusa's popularity! Meanwhile, a report today in Yomiuri Shimbun and another one in the Mainichi Daily News indicate that JAXA is zeroing in on a probable cause of the orbit insertion failure, and that it likely originated in the malfunction of a single, simple, standard part, a one-way valve. As usual there is useful discussion going on at unmannedspaceflight.com with further details.